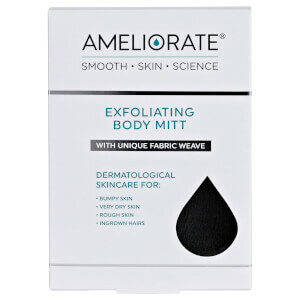 AMELIORATE Transforming Body Lotion Hint of Colour is a UK first! A lightweight, everyday body lotion designed for Keratosis Pilaris that exfoliates, moisturises and adds instant, wash-off colour. For those with KP (chicken skin) and redness, the hint of colour will help to camouflage the redness whilst the active ingredients progressively smooth away bumps and soften and moisturise rough, dry skin. Clinically proven and dermatologist tested it is suitable for face and body. It makes Keratosis Pilaris look and feel better, deeply hydrates very dry skin and leaves normal skin amazingly soft and smooth with instant colour. DIRECTIONS: Massage evenly into clean, dry skin. Wash hands immediately after use. Removes easily with soap and water. Use in place of AMELIORATE Transforming Body Lotion when you need an extra hint of colour. What a great product you’ve brought out, makes my skin so soft and a perfect tan too, Wonderful. I’ve seen such a difference in my skin, especially the front of my legs, I’ve used the body lotion for at least 4 months now and, Wow!, what a difference. I use this only on my legs and it is moisturising and the colour is really good. My sole complaint is it\'s really hard to wash off my hands after applying. I end up scrubbing with a nail brush. I think it would be worth advising the use of gloves for application. Otherwise, very pleased - loss of a star is owing to the hand scrubbing!